Hay House Visions, 9781401942687, 352pp. "Something in me knows of a life I was meant to live but for whatever reason, I have not . . . "Words that ring painfully true for Adam Sheppard, a San Francisco programmer who has spent the vast majority of his 30-something years lost in the dim glow of a computer screen. On the verge of a psychotic break, Adam begins to have a recurring dream of his early childhood and the hauntingly rustic town of Mendocino, California, where he grew up. Convinced he has left something behind there, something vital to his present sanity, Adam walks away from his current life to figure out what that is.One evening, out on the cliffs overlooking the Pacific Ocean, Adam has a chance encounter with a mysterious woman, only to later realize that she may be a long forgotten childhood friend. The coincidence of their reunion only deepens as Adam discovers that the woman has also returned to Mendocino due to a recurring dream, eerily similar to his own.Lost soulmates drawn together through time and space, or perhaps their meeting is only the beginning of a much deeper mystery. As Adam awakens to the possibility that his life could be destined for more than a bleak virtual wasteland, he soon finds himself a crucial pawn in a game that pits forces intent on enslaving the human spirit against those few quixotic souls who still search for meaning, beauty, and magic in the world. 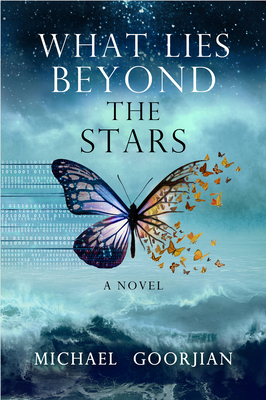 "Haunting, original, riveting, poignant, insightful, and passionately romantic, What Lies Beyond the Stars is the visionary and transformational love story of the 21st Century. Michael Goorjian has created unforgettable characters who illuminate how our humanity can triumph when we open our minds and hearts to the magic and mystery of life itself. I’ll always remember this book and reread it again and again . . . and so will you." "Though I am not generally a reader of science fiction or technology-related fiction, I found Michael Goorjian’s What Lies Beyond the Stars to be so much more and therefore a rather pleasant surprise. Goorjian explores the dangers of a technology-dependent society but does not beat the reader over the head with the normal doom and gloom the genre usually exhibits. The ending is hopeful, not just for the main characters but for society in general, and that is truly refreshing. The explanations of the theories of alternate existences bring about the sort of soul-searching questions we all should be asking ourselves." "It was such a pleasure to get lost in a good book. I found Goorjian’s story to be thought-provoking and his writing, beautiful. His book held my interest from beginning to end and left me asking the bigger questions of life—what really matters, what’s the true nature of time and reality, and is there another life calling for my attention? I highly recommend getting lost in this book." "A uniquely riveting vision of the inferno of our present world joined to a redeeming promise of the magic of love calling to us from within. Adam Sheppard is truly a hero of the modern world." "Michael Goorjian’s new novel—a deep exploration of love lost and found across time—is a wonder to behold. If you believe in the possibilities of dreams coming true, you’ll love this thrilling journey of hope and spiritual connection."